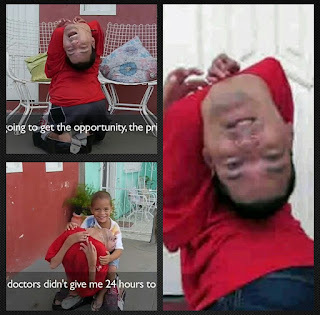 A man who was born with a rare physical condition, in which he was born with head upside down - his mum rejected doctors’ advice by keeping him alive and left him looking badly deformed. Claudio was born with a rare condition that contorted his spine and limbs. His head rests backwards on his spine and his limbs lay twisted under him, his head simply and completely upside down. As Claudio grew, he realised he could walk on his knees, and even use a pen with his mouth and his lips to operate a cell phone. As the years went by, he grew in confidence. Today, Claudio is 37 years old and an accountant, celebrated public speaker and published writer.